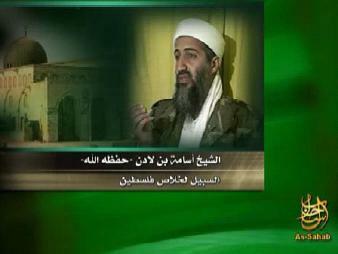 Image of Osama bin Laden from his latest audio presentation on Somalia. Al Qaeda leader Osama bin Laden praised the efforts of Somali jihadi groups battling the new government and called for the overthrow of the new president. Bin Laden’s latest message, an audio recording with his image superimposed on a map of Somalia, is titled “Fight On, Champions of Somalia” and is exclusively devoted to the Somali jihad. The recording is the third al Qaeda message by senior leaders since Feb. 13 specifically addressing Somalia, indicating the importance of this theater to the terror group. Bin Laden described the fight in Somalia as “a war between Islam and the international Crusade,” according to a translation from the NEFA Foundation. He claimed that the West “deputized Ethiopia” to fight against the Somali Islamists, a reference to the Ethiopian invasion of Somalia in December 2006 to oust the al Qaeda-backed Islamic Courts Union, and the subsequent occupation which ended in February 2009. He continued: “[T]hey and those who appointed them were exhausted by your blessed jihad” and “resorted to subterfuge and deception” by co-opting Sheikh Sharif Ahmed, the former leader of the Islamic Courts. In actuality, Ahmed split with his co-leader and al Qaeda ally Hassan Dahir Aweys after the Somali insurgency intensified. Ahmed sought to form a unity government with the UN- and Ethiopia-backed Transitional Federal Government, while Aweys wanted to expel the Ethiopians through force and install an Islamist regime. Ahmed and his faction of the Islamic Courts, known as the Alliance for the Re-Liberation of Somalia – Djibouti, joined the transitional government at the end of January of this year. Ahmed was named president by the new Somali parliament. Bin Laden described Ahmed and other Muslim leaders cooperating with the West as “the surrogates of our enemies” who have no standing in the Islamic world, have abandoned their faith, and must be overthrown. “Their authority is null and void in the first place, and as [Sheikh Sharif Ahmed] is one of them, he must be dethroned and fought,” bin Laden said. He described Ahmed as an “infidel” who “must be removed by armed force” as he would not impose sharia, or Islamic law, in Somalia as promised as he was “installed to demolish” it. “Your patience and resolve supports your brothers in Palestine, Iraq, Afghanistan, the Islamic Maghreb [Algeria and North Africa], Pakistan, and the rest of the fields of Jihad,” bin Laden said. He also implored the Muslim world to back the Somali jihad. “The victory of the Mujahideen in Somalia is a matter of extreme importance, and not backing them nor taking their hand is extremely dangerous,” he finished. Al Qaeda has devoted considerable propaganda resources to Somalia over the past two months. Bin Laden’s tape is the third message from al Qaeda’s senior leadership since Feb. 13. Abu Yahya al Libi, a senior al Qaeda spokesman and religious and ideological leader, called for Somalis to fight the Ahmed government, in a video released on Feb. 13. “Aim your arrows towards them…, direct your battles against them and intensify your campaign against them,” Libi, who escaped from Afghanistan’s Bagram prison in 2005, said according to a Reuters translation. “Prepare to fight against the campaign of conspiracies illustrated by the recent farcical presidential election …, which America — the world leader of infidels — was the first to welcome,” Libi said. Ayman al Zawahiri, al Qaeda’s second in command, praised Shabaab for the capture of Baidoa, the former seat of the Transitional Federal Government parliament, during a videotape released at the end of February. Zawahiri said the “mujahideen” will continue to fight President Sharif Ahmed’s government. “They — with God’s help — won’t lay down their weapons until the State of Islam comes to light; and that they will engage in Jihad against the American-made government in the same way they engaged in Jihad against the Ethiopians and the warlords before them,” Zawahiri said. Al Qaeda has consistently backed the jihad front in Somalia through funding, personnel, and weapons. Several senior al Qaeda operatives are members of Shabaab. The group has conducted multiple suicide attacks in Somalia and has vowed to continue to strike at African Union peacekeepers. In September of 2008 Shabaab formally reached out to al Qaeda senior leadership in an effort to better integrate with the network and its strategic nodes across Africa and the Middle East. The effort came in the form of a 24-minute video that features Kenyan al Qaeda operative Saleh Ali Saleh Nabhan, who is wanted by the U.S. Government for his involvement in the 1998 African embassy attacks and 2002 Mombasa attacks. Shabaab is formally seeking to join al Qaeda. Either he looks too bad off for video, or he’s a corpse. Me thinks OBL is still slithering, but al qaeda can’t figure out where the intel is coming from for the in-Pak predator strikes. As a result HVT’s are growing very reluctant to stick their heads up any more than necessary. The leadership will get more and more paranoid as more HVT’s are hit and as the good guys continue to shrink the no-go zones in the region. – AQ is anything more than a rallying name for global Islamic expansion. According to open press, every audio recording made by UBL has been a fake. Vocal analysis does not match anthing taken after 12/01. According to a Swiss security firm with conducts vocal analysis, several irrefutable voice analysis were compared to post 12/01 “interviews”–all of which did NOT match with UBL and all were seperate subjects. US should start aerial reconnaissance and DRONE ATTACKS in Somalia from sea, before it goes out of control. SwenderM, unfortunately that’s probably the worst thing we could. US support of Sheikh Sharif Ahmed would effectively destroy his credibility and ARPCT aid Shabaab in their propaganda campaign that he’s a puppet of Western influence. US aid to the ARPCT are what helped drive the ICU in their original attempt to seize power. Rather than aid him directly, a better option might be to fund and influence the AU forces to train and aid Somalia security forces. Ethiopia is hated in Somalia, but we can use other African militaries to support the Somalia government. Hmm, I seem to have botched that comment by somehow copying ‘ARPCT’ into the second sentence, please disregard. Oh and on the Osama issue….he’s probably alive, but what does it really actually matter? The foot soldier Jihadis think he’s still alive. If he has indeed died, they probably won’t ever find out. If he’s alive, he reportedly has little control over the day to day running of Al Qaeda anyway, beyond releasing tapes now and then. His death makes surprisingly little difference to the overall situation. I generally accept the premise that OBL is alive, at least until solid evidence says otherwise. If there is a conspiracy, it’s on Al Qaeda’s end. The former administration would prefer him dead, and certainly didn’t need him alive to justify operations in Afghanistan. I must say, I do have some lingering doubts about the efficacy of voice identification and other aspects of this. The Thunder Run has linked to this post in the blog post From the Front: 03/20/2009 News and Personal dispatches from the front and the home front. Is this the same BinCoward who urged his followers to fight the Russians in Afghanistan in the 80’s. The same coward who when faced with superior forces and firepower in Jaji in 1987 turned and ran when about to be surrounded and eliminated by those same Russian forces. And the same coward who urged his forces to fight the US in Afghanistan in 2001. And who once again when faced with superior forces and firepower ran like the coward he is to Tora Bora. Then called for a cease fire to stop the bombs from falling so he could run across the border into Pakistan. Sounds to me like all he is good for is inciting others to fight for his cause while he continues to run when the battle gets a little to intense for him. So much for the old fighting to the death. Nothing but a bunch of cowards. Sounds like the same guy to me. btw Fox Report just mentioned the FBI is on the hunt for a bunch of AQ affiliated terrorist who are likely back in the states after a training vacation in Somalia. Cowinkydink? Back to the topic of Somalia; I would expect a steady stream of Al Qaeda pronouncements encouraging further militancy within Somalia. It’s a nice propaganda story for them. Somalia is a relatively minor strategic prize when compared to Iraq, but it’s a old sore spot with the US and a major opportunity for mayhem. Poor Somali’s, I wonder what percentage of Southern Somalia’s population has been decimated over the last 17 years so Al Qaeda can create a little pain for the west. Me thinks, Usama lives, works in an office and not in Pakistan. Me thinks, he will forever. But he is probably in a location that his security team do not feel that they can adequately “clean” to remove all possible clues for it’s location. They are also getting VERY paranoid about moving in populated areas because of the growing number of casual informers that can lead to drone strikes or to a potential future action by the Pakistan Army (IF the politicians ever get their act together.) It is also probable that their informers in the ISI are drying up along with the support for Radical Islam as the army prepares to go to war.